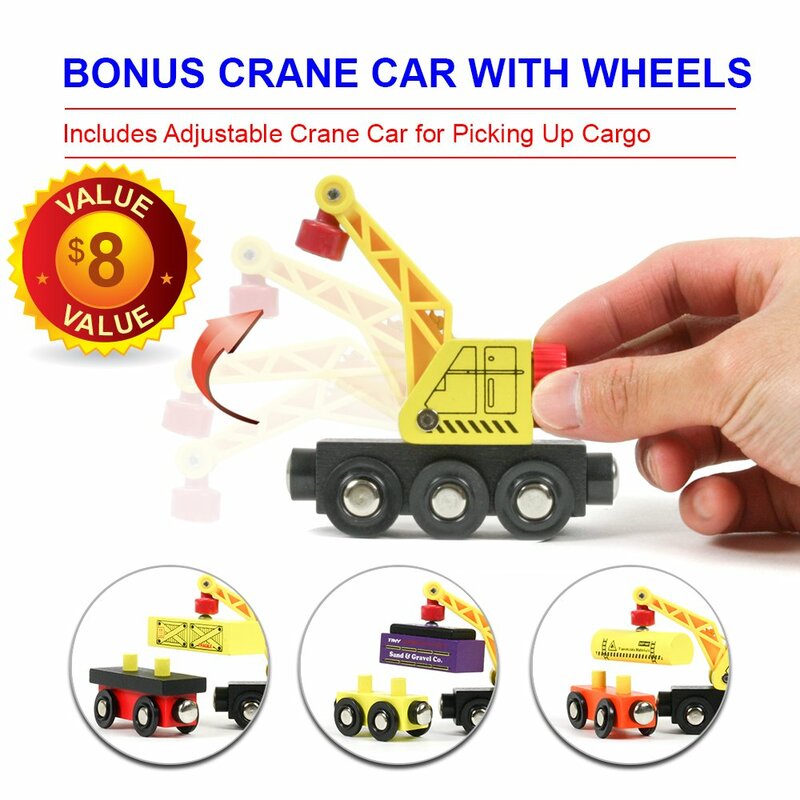 BONUS CRANE CAR WITH WHEELS ($8 VALUE) – The ONLY train set sold on Amazon that includes a working crane car for picking up cargo. 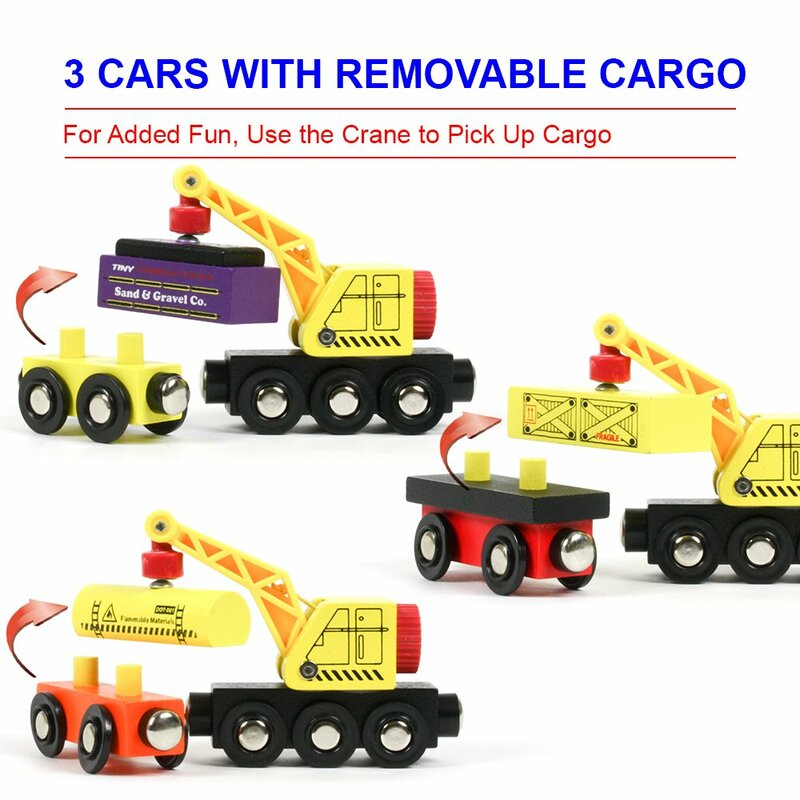 For added fun, we specially designed 3 train cars to have removable cargo so that they can be picked up by the crane. 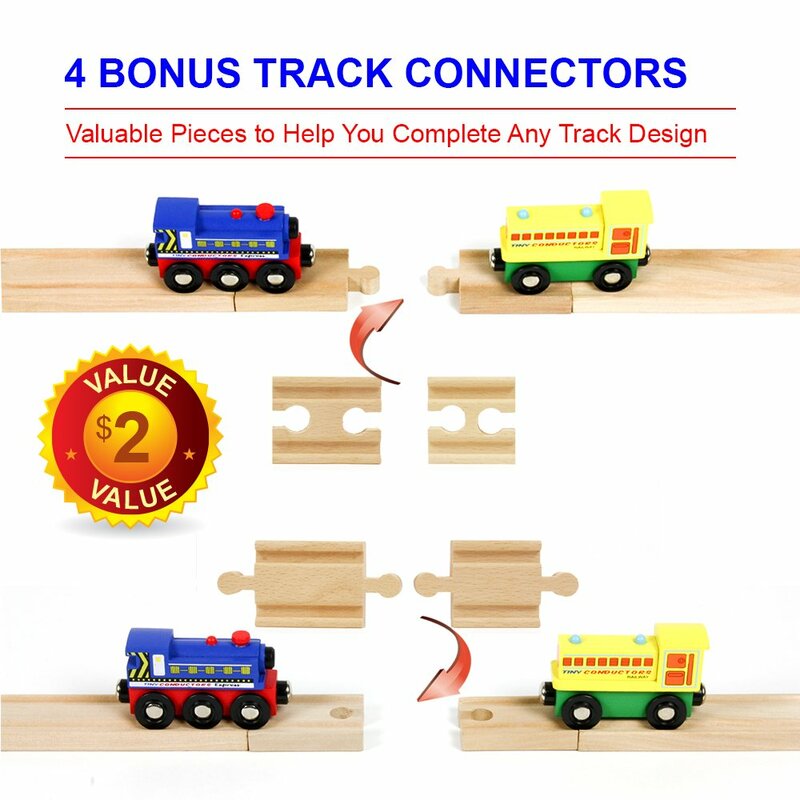 4 BONUS TRAIN TRACK CONNECTORS ($2 VALUE) – Never get frustrated building your train tracks again! Our 2 male-male & 2 female-female adapters allow you to fit the end of any track piece into any other track to help you complete whatever track design you want. 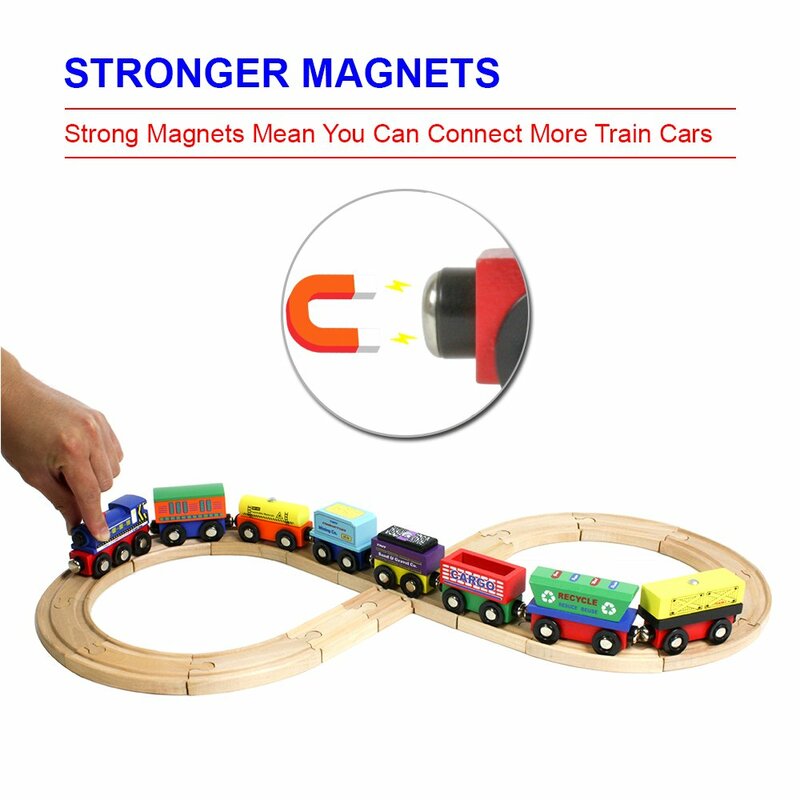 STRONGER FRONT & REAR MAGNETS FOR LONGER TRAINS – The magnets on our trains were carefully chosen and have been tested extensively to be stronger than those in other sets. This means more train cars can be connected together to make longer trains. MEETS ALL U.S. TOY SAFETY REQUIREMENTS – This product complies with all US toy safety standards and are free of lead, cadmium, and phthalates. 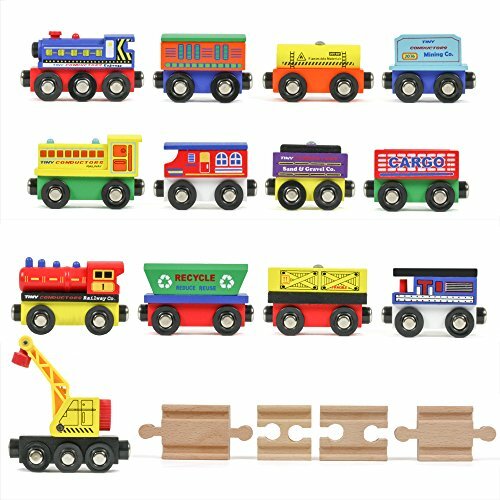 GUARANTEED COMPATIBILITY WITH ALL MAJOR TRAIN SET BRANDS – Tested thoroughly and proven to work with Thomas and other major brands of wooden toy railroad sets. A very good Christmas present he loved them well made but a little pricey. Tiny Conductors 12 Wooden Train Cars are defiantly a great idea. We have so much track and only like 6 trains so I am going to buy this for Christmas for one of my grand kids. You won”t go wrong here this is a really good buy. They will make different tracks and play for hours with them. I have ages of grand-kids from 1 to 8 and they all still build things when they come over. I give it a high rating because it’s something my kids love!!! A great price, a great hit, you won”t be sorry!!! !